These cupcakes are really special. The color of the cake is so appetizing and the flavor is hard to describe; it is tangy with a just touch of vanilla and chocolate. The best part about the cake is the velvety texture: soft, moist and spongy. Also, don’t be put off by my long introduction to this recipe. 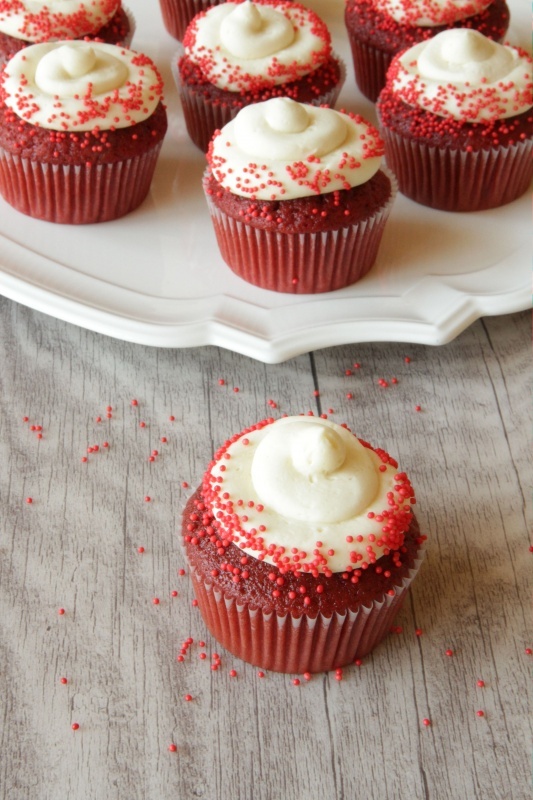 Red Velvet Cupcakes with Original Red Velvet Frosting are actually simple to make! Red Velvet Cake is a traditional cake with its roots in the Southern U.S. It is said that the red color came from the chemical reaction of the cocoa powder with the vinegar and buttermilk but this natural coloring method was reddish-brown at best. 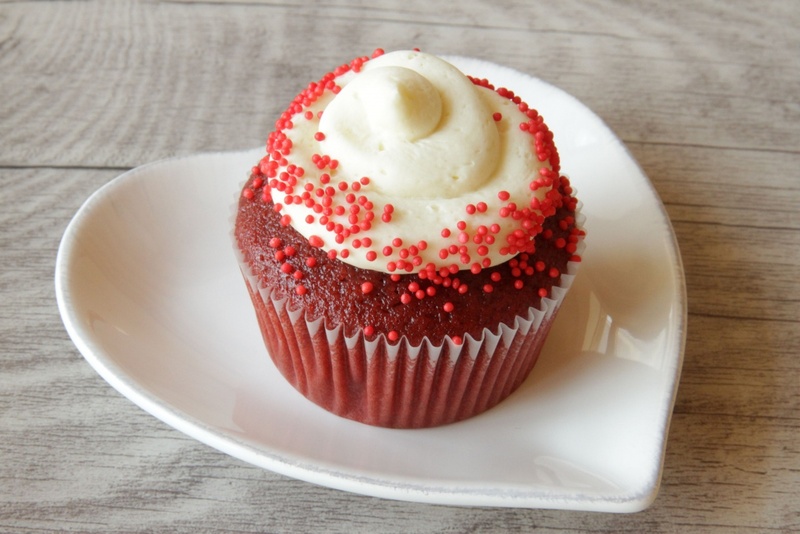 Nowadays, most Red Velvets get their deep, brilliant hue through the addition of plenty of red food coloring. Most American recipes for Red Velvet Cake call for Cream Cheese Frosting. If you want to make your cupcakes with Cream Cheese Frosting, try using my recipe for Cream Cheese Frosting. And I think this Mascarpone Frosting would also be amazing. The frosting I made for these is the “original” frosting for Red Velvet Cake. It is also known as “whipped” frosting or “boiled” or “roux” frosting because you cook flour and water together to make it. This frosting tastes impossibly silky, like vanilla whipped cream with more depth and body, and I love it because its flavor doesn’t overpower the Red Velvet Cupcakes. 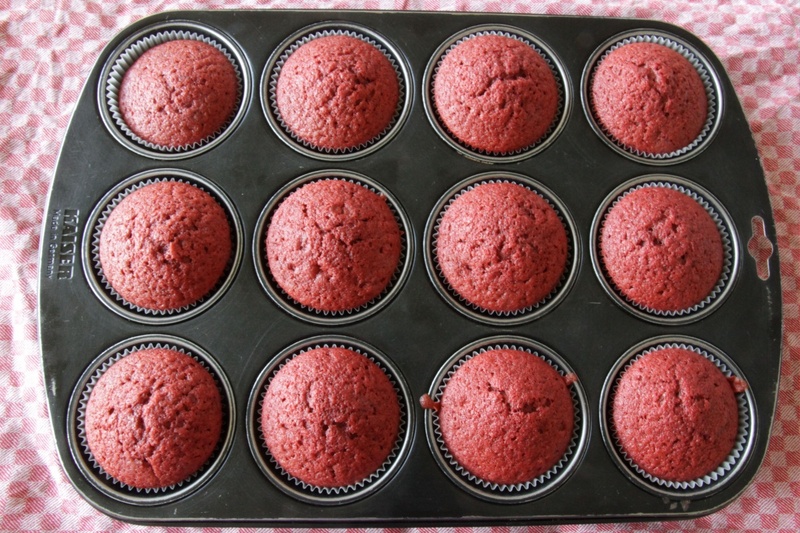 I noticed that most recipes for Original Red Velvet Frosting call for milk, and not water, to cook with the flour. I have an aversion to milk and the recipe I have always used calls for water so I can assure you that this recipe is fabulous. If you would rather use milk than water in this recipe, I’m positive it would work just as well. I’ve slightly adapted Paula Deen’s recipe for Red Velvet Cupcakes. 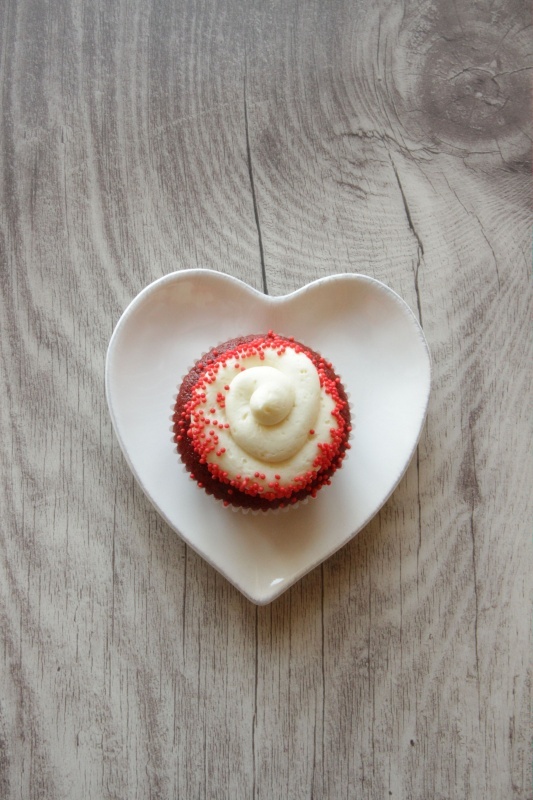 I got the recipe for Original Red Velvet Frosting from friends who used to live in the South. 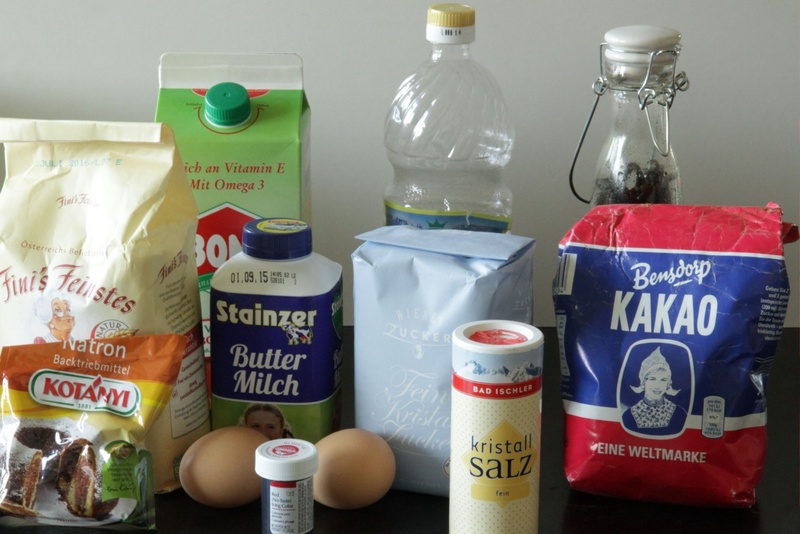 The cupcake ingredients. In the front you see the little container of red food coloring? I use half of a 1-ounce container like that for this recipe. 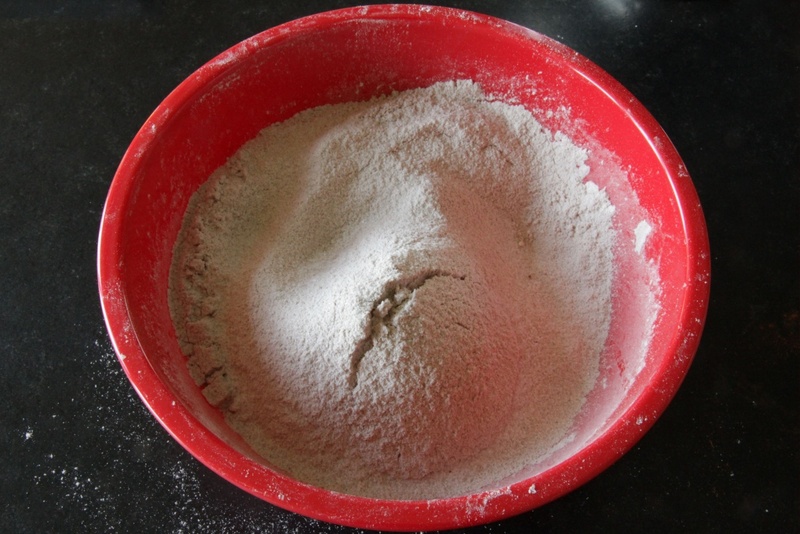 The flour sifted together with the sugar, baking soda, salt and cocoa powder. 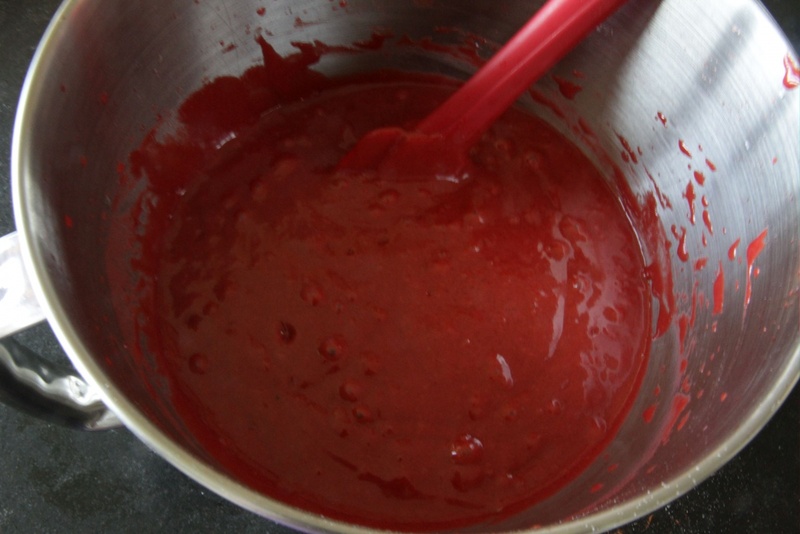 The buttermilk mixture – you can see the bright red color you want to achieve. The finished cupcake batter with the flour-cocoa mixture already mixed in. Preheat oven to 350°F (165°C). Line standard muffin tins with paper liners. For the cupcakes, in a medium bowl, sift together flour, sugar, baking soda, salt and cocoa powder. In a large mixing bowl using a hand-held electric mixer, gently beat together the oil, buttermilk, eggs, food coloring, vinegar and vanilla. 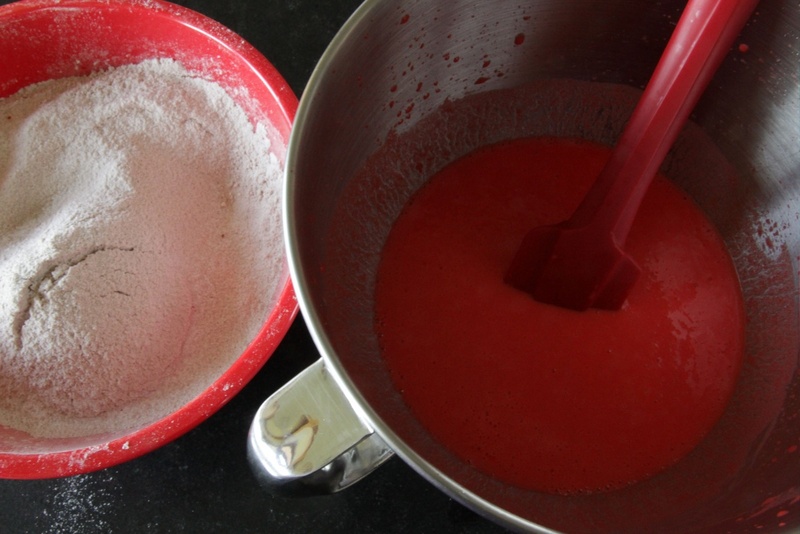 Add the sifted flour mixture and mix until smooth and thoroughly combined. Fill the cupcake liners ⅔ full with batter. Bake for 19-20 minutes, until a toothpick inserted in the middle of a cupcake comes out clean. Cool for 10 minutes in the pans on wire racks then remove the cupcakes and cool completely. For the frosting, whisk together flour and water in a medium saucepan and cook over medium heat, stirring constantly, until the mixture becomes very thick and pudding-like. Cover and set aside to cool to room temperature (at least 2 hours). Using a stand mixer fitted with the whisk attachment, beat butter, sugar and vanilla on high speed, scraping bowl with a rubber spatula occasionally, until lightened. Add the cooled flour mixture and beat on high until airy and fluffy. It should have a light and silky texture and with no remaining sugar crystals. Frost the cupcakes with a butter knife or pipe on frosting with a large round tip swirling from the outside of the cupcake to the center. Add red sprinkles if desired. 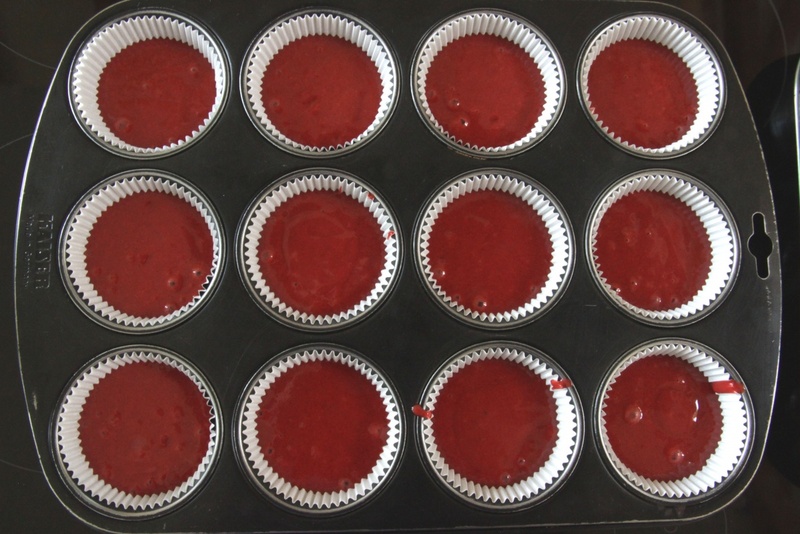 A couple of tips about the frosting: cook the flour and water before you start making the cupcakes so the mixture has time to cool to room temperature. It has to be completely cool and not the slightest bit warm before you add it to the whipped butter and sugar. Sometimes this frosting looks curdled and takes up to 15 minutes of beating to come together. If it separates after you’ve made it, you can beat it again to bring back the fluffy texture.